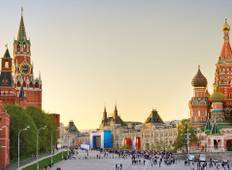 Find a culture trip that explores Russia. There are 55 cultural tours to choose from, that range in length from 3 days up to 40 days. The most popular month for these tours is June, which has the most tour departures. "As expected, Intrepid has proven to be a reliable company with great organised tour...."
"Monika, as my tour guide, has had such a significant and positive impact on my life!..." "It was amazing in all ways"
"I’ve always wanted to travel to Russia but didn’t fancy doing it on my own and..."
"The G Adventures tour we booked through Tour Radar was excellent with an outstanding..."
"Amazing. The local tour guide was fantastic and very helpfully." "The Most Comprehensive Tour of Russia We just came back from our Grand Tour of Russia...."
"I enjoyed my trip to Russia, but my experience has now been soured by recent events..."
"I cannot say enough good things about Greg! 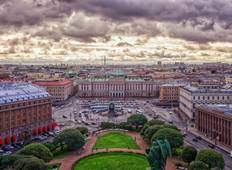 I have done quite a few tours and he..."
"A great itinerary that covers the 2 major cities of Russia, plus some less-travelled..."